You are experiencing the exact same problem: in this case, I tried to rename a file called hello.pdf in Windows Explorer. 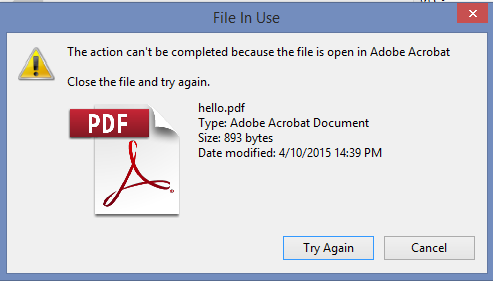 However, this action could not be completed because the file was open in Adobe Acrobat. Tools such as Adobe Reader and Adobe Acrobat need random file access to the file and will therefore lock that file so that no other process can remove, rewrite, rename that file. The solution is also shown in the dialog box: Close the file and try again. You are trying to do something that is impossible (and that is not related or limited to you using iText). When working on an iText project, I experience the same problem you describe very often: I write some code, run it, look at the resulting PDF, change the code, run it, and then get the same exception you get. To avoid this, I often create files that have a timestamp in their name. E.g. hello-20150411163400.pdf, and then when I run the same code 30 seconds later hello-20150411163430.pdf and so on (the filename is created based on the current date and time). This way, I can avoid that exception. The stream in your program is open even after reaching the end of the program. You can start by closing the stream then reopening for next use of the stream. You will need to add a finally block at the end of your last catch block and inside that close the streams that you are using, for example. Next, you will need to add code for "editing" purpose where you can open the stream again to read the earlier file (by giving the path to the created file). Remember to close the stream again. Not the answer you're looking for? Browse other questions tagged java pdf itext or ask your own question. Why streaming subscription is not working in Java EWS API? how to run executable via processBuilder?